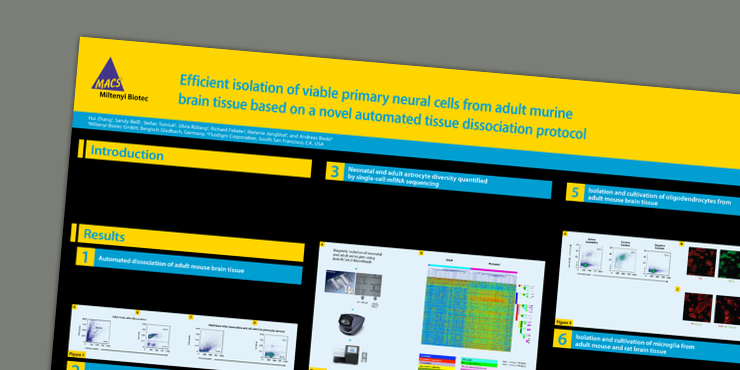 Discover our different workflows for neuronal cells and find the one that fits your experimental needs. Join Dr. Hui Zhang and her webinar on the latest options and integrated solutions for neuroscience research and the use of MACS Technology for adult brain dissociation and neural cell isolation. Cleared cell suspensions obtained with the Adult Brain Dissociation Kit, mouse and rat contain noticeable less cell debris and erythrocytes. The viable and pure cells are ready for subsequent cell isolation, cultivation, and analysis. Cell suspensions from adult brain contain a significant amount of cell debris and erythrocytes (A), which hampers subsequent cell isolation, cultivation, and analysis. The Adult Brain Dissociation Kit, mouse and rat optimizes the tissue dissociation process, and after sample clearing yields living cells with much less cell debris and erythrocytes (B). Whole brain tissue from P4 mice dissociated with the Neural Tissue Dissociation Kit (P) results in a high yield of viable cells. Mouse whole brain tissue (P4) was dissociated using the Neural Tissue Dissociation Kit (P) and the gentleMACS™ Octo Dissociator with Heaters. The cells were stained with Propidium iodide and analyzed with the MACSQuant® Analyzer. 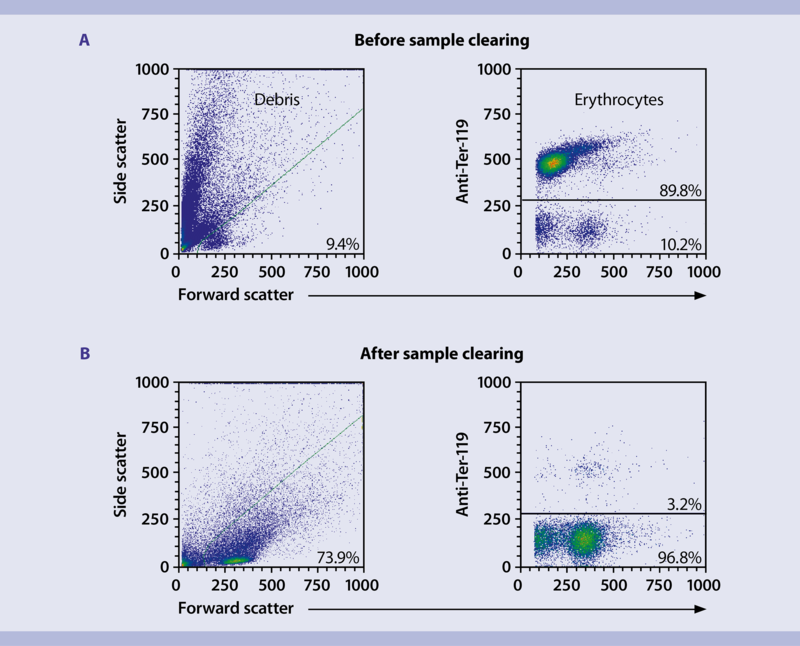 Flow cytometry analysis showed that the dissociated cell suspension contained minimal debris (A) and a very high percentage of viable cells (B). Untouched neonatal and adult neurons can be purified by magnetically labeling and depleting undesired cells with the Neuron Isolation Kit, mouse. The untouched isolation is simple and fast. It takes only one hour to acquire highly purified and viable neurons from a single cell suspension. The high purity of the isolated neurons relies on the specificity of the non-neuronal cell surface marker used in the Neuron Isolation Kit, mouse. Isolation of neurons from neonatal and adult mouse brain. 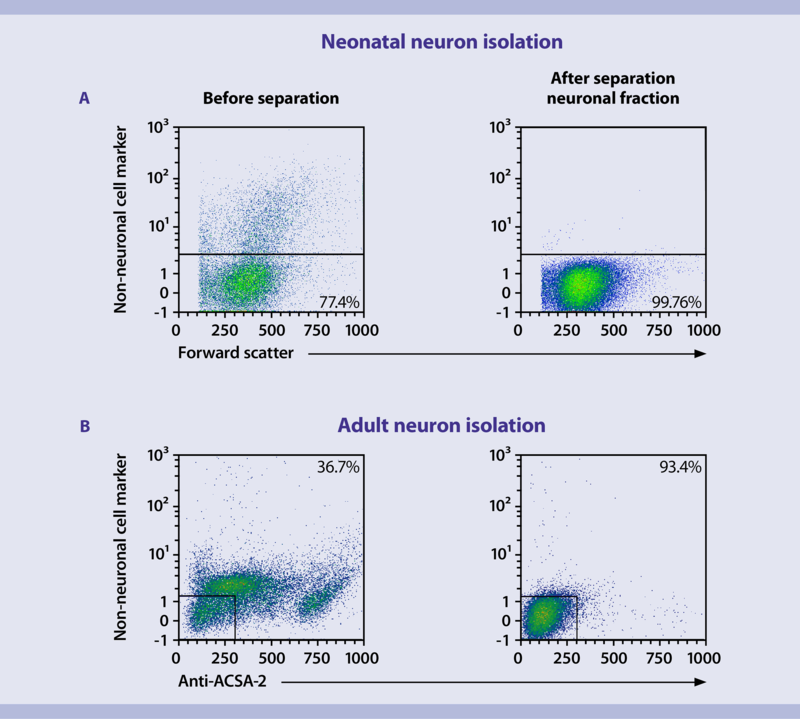 (A) P1 mouse brain was prepared using the Neural Tissue Dissociation Kit - Postnatal Neurons and neonatal neurons were isolated from the single-cell suspension using the Neuron Isolation Kit, mouse. Cells were fluorescently stained with antibodies specific for non-neuronal cell antigens and analyzed by flow cytometry using the MACSQuant Analyzer. (B) Brain tissue from 3-months-oldmice was prepared using the Adult Brain Dissociation Kit, mouse and rat and adult neurons were isolated from the single-cell suspension with the Neuron Isolation Kit, mouse. 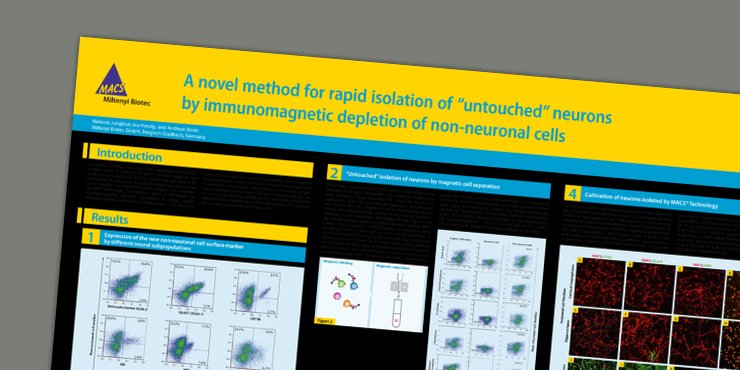 Cells were fluorescently stained with antibodies specific for non-neuronal cell marker and the ASCA-2 antigen and analyzed by flow cytometry using the MACSQuant Analyzer. Cultivation of primary adult mouse neurons can be a challenging task. MACS® NeuroBrew®-21 supplement has been designed for optimal growth and long term viability of neural cells of the central and peripheral nervous system. Experience the growth of nearly pure populations of neural cells in culture without the need of an astrocyte feeder layer. Primary adult mouse neurons were cultured in MACS Neuro Medium, MACS NeuroBrew-21, 1% P/S, 0.5 mM L-glutamine and BDNF (incubation for 3–6 hours with 50 μg/ml BDNF at day 3) on PLL-coated glass coverslips. After 7 days cells were fixed and stained with the neuron-specific antibodies Anti-MAP2 (green) and ßIII Tubulin (red). Neural cell–specific monoclonal antibodies allow a fast and easy way to perform immunofluorescent staining for subsequent microscopy analysis. Benefit from short primary antibody incubation and the possibility to stain PFA-fixed neural tissue cryosections and adherent or fixed neural cells in vitro. Immunofluorescence staining of the neuronal cell marker CD171, also known as L1CAM (L1 cell adhesion molecule). PFA-fixed cultured neuronal cells and cryosections of PFA-fixed cerebellum and olfactory bulb were stained with CD171, pure, mouse antibody and analyzed by fluorescence microscopy. A detailed staining protocol is available for download on the right. Microscopy analysis of cultured neuronal precursor cells and cryosections of adult mouse brain after anti-PSA-NCAM staining. 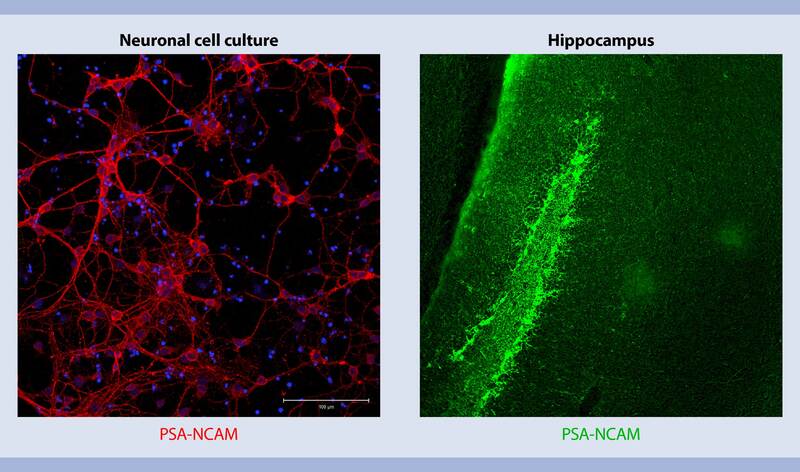 PFA-fixed cultured neuronal precursor cells and cryosections of the PFA-fixed hippocampus were stained with Anti-PSA-NCAM, pure, human, mouse, rat antibody and analyzed by fluorescence microscopy. A detailed staining protocol is available for download on the right.